Rachel Frances Spears (1842-1863) was the daughter of Drury Alsbrook Spears and Mary Ann Parks. Through most of her life she went by her middle name, Frances. In 1857 she was attending the Oddfellows Female Institute near her home in Rogersville, when she stitched an image of the institute on her sampler. Frances never married. She died during the Civil War in 1863. 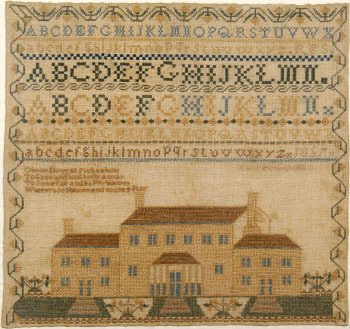 Frances’ large and impressive sampler features cross, cross over one, eyelet, rice, and queen stitches.